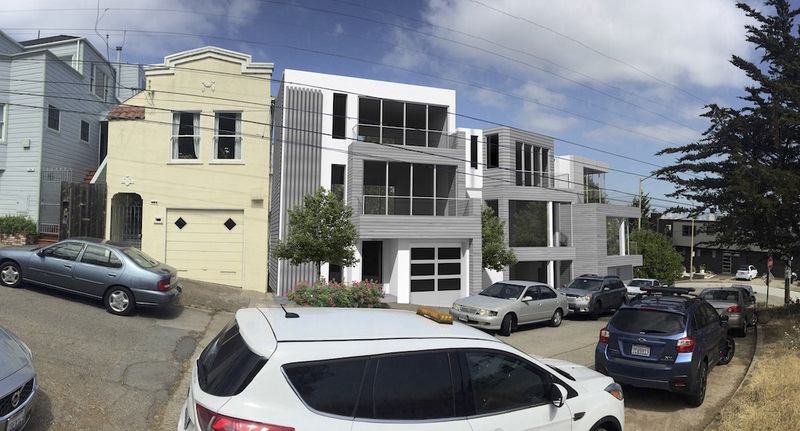 Your Bernalwood editor attended last night’s meeting of the Northwest Bernal Heights Design Review Board at the Bernal Library to see the big reveal of the proposal to build two new homes at the top of Coso at Bonview. You can read the background on the project here. 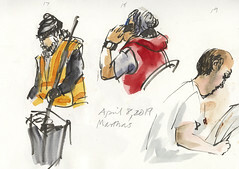 There was a capacity crowd of 45 at last night’s session, making it by far the biggest northwest Bernal design review meeting in a very long time. As you can see up above, the architects shared some renderings of what the completed project might look like. 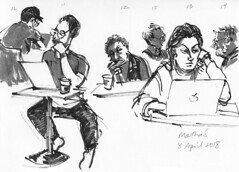 As for the meeting itself, in general it was tense but civil. 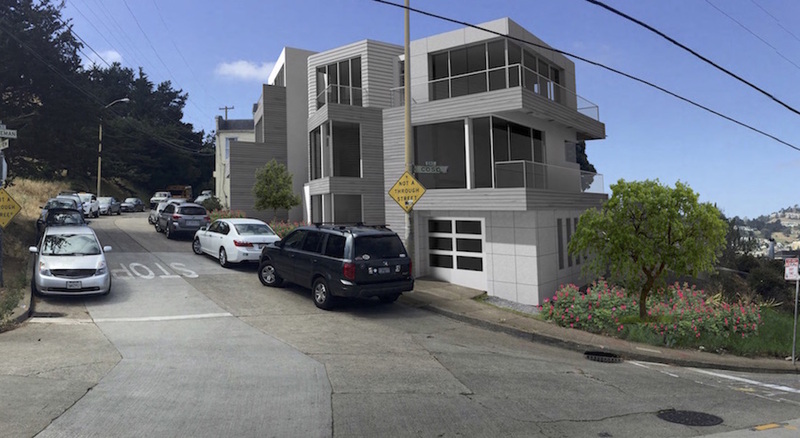 A small number of Bernal neighbors seemed dead-set against the project for reasons that seemed to combine aesthetic disgust with an enthusiasm for class conflict. But overall, most neighbors had perfectly reasonable questions about how the proposal might impact their own circumstances in one way or another. The architects were not particularly polished, and their presentation tools were clunky, but they had a very good grasp of the details and were (mostly) able to provide clear answers to probing questions. Their responses probably didn’t satisfy everyone in the room, but they did convey the sense that they had tried to create a design that was sensitive to existing neighbors and the neighborhood. One issue seemed a little dodgy: As proposed, the height of 6 Bonview raised some eyebrows, because it was calculated via some quirky ways the designers chose to measure the undulating elevation of the site. 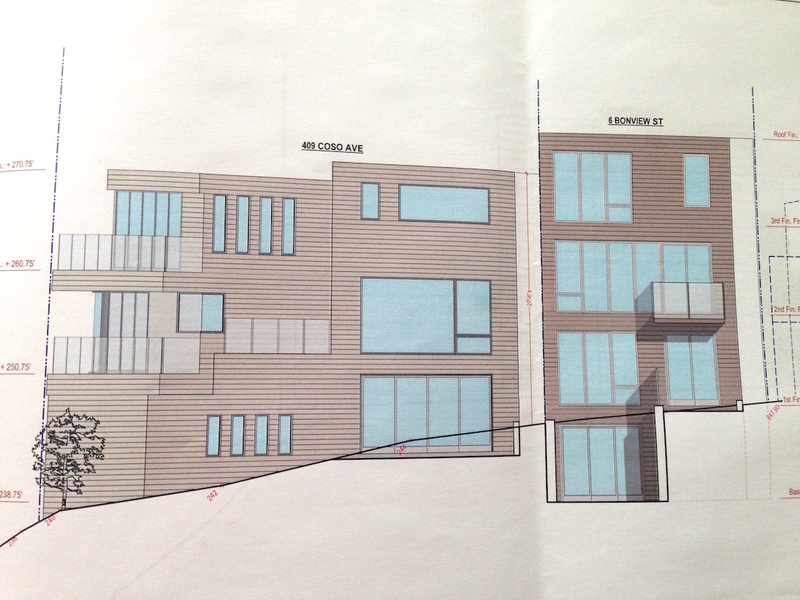 Time will tell how this issue plays out, but otherwise, the design appeared to meet Bernal’s existing codes. I’m jealous. Let’s fight it. They are beautiful! Way to go Bernal Heights. Design is nice. OMG. These homes are going to be gorgeous. I wish I could live in one of them. Let’s not stand in the way of progress. I fully support these homes being constructed!! The designs are one of the best I have seen in a long time. There is lots of space, light. These 2 buildings will definitely be an upgrade to the area. Since the plans have passed the Planning & Building Codes, let them be built. Ah nice… like the Mukesh Ambani house, but shorter! There is a Bernal Design Review Board meeting Monday June 8 at 44 Elsie St. to discuss the renovations planned for this home. 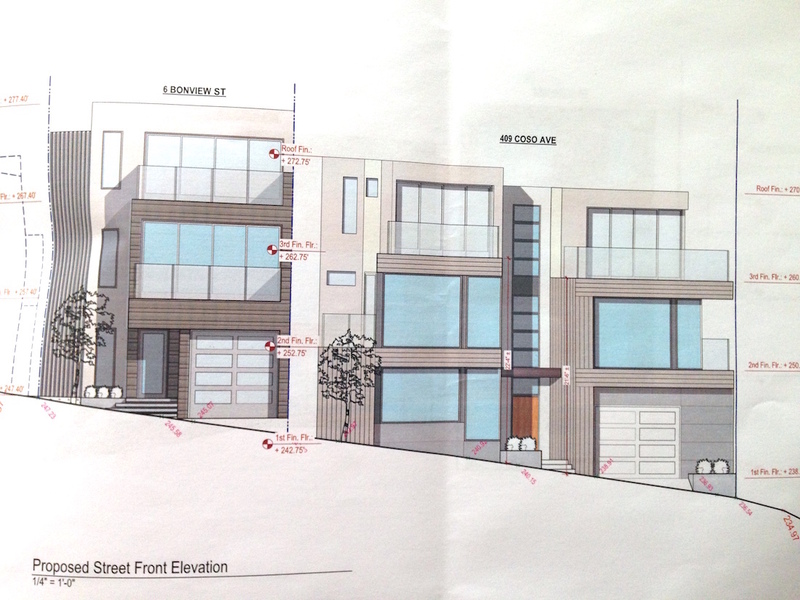 The proposed design will block the little remaining sunlight until fall for a number of homes on Winfield St. I have left a message requesting the architects present architectural shadow graphics at their presentation. The meeting is Monday June 8 from 7-8pm at 44 Elsie St, home of Ben and Charlene Son Rigby. I attended the meeting and feel like the concerns from the impacted neighbors were very reasonable. Group was attended by many more though. From a quick looks at the SF Planning code, looks like it defines the grade to be measured from the frontage curb, and not from the top of the soil mound that the architects would like to use. Check out Sections 102 and 260. Anyone else understanding this the same? Seems like that would be a little help for the height impact! They look like nice homes. Best of luck to those trying to get this done! I hope the time spent dealing with the obstructionists pays off in the end. Interesting one lot came with a Coso address. I can’t imagine a time when planners thought you could access this property on that side. I wish I could get the owner of the home next door to reduce the height of his house. It blocks a lot of my light in the fall/winter. There is also a giant tree a few houses away from me that if someone would just cut it down, I’d get 2 more hours of light in my backyard a day. Oh, and can we shorten Bernal Hill? It casts a crazy shadow sometimes. Bernal Hill was unpermitted, and installed under cover of darkness. All kidding aside does SF have different “air space” rules than say NYC? Over the years I’ve heard so many whiners in SF about blocking their view. Just look at the embarcadero and the rotting piers. I know in NYC there are no such air space rules. If someone wants to build 100 stories next to or across from you then no one is going to be able to fight that in a neighborhood meeting. There are no view rights in SF. There are height restrictions in various neighborhoods, and light and air concerns. In NYC there are indeed air space rights. They’re sometimes traded. I was there and found the meeting to be a good first step. As mentioned the developer will need to go back to the drawing board with regard to how they measure the height of the homes relative to the hill grade, as well as which street they use as the benchmark. For example should the Coso street address house use Bonview(which is higher) to determine the height of the house. I found the neighbors who are getting impacted the most, Elsie street residents who’s homes back yards are adjacent to the properties and the two nearest homes on Bonview(the south side addict home have several windows facing the property line) were all very reasonable and cordial. 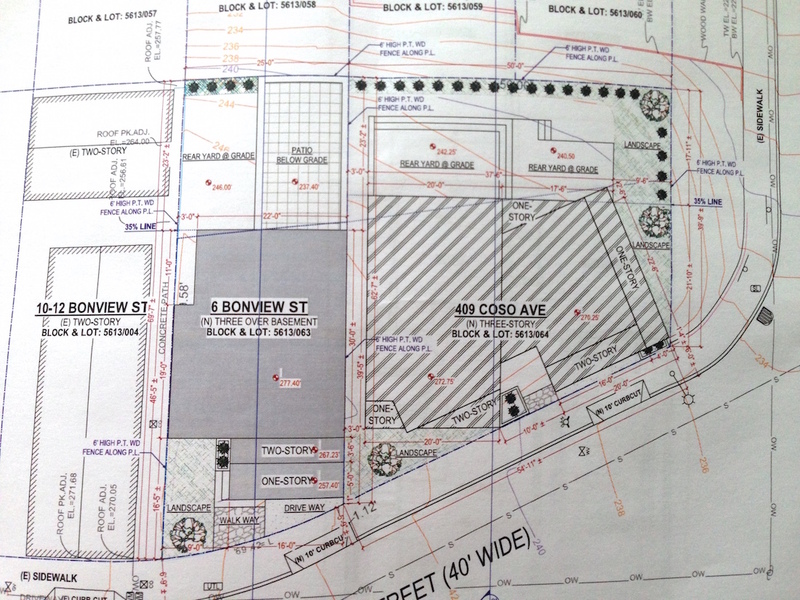 Could the developer move the properties closer to Bonview? what considerations are they making to unsure the hill doesn’t collapse on them during or after construction? Are they following the code? For as many people that were there it was neighborly. The most volatile issue was the way by which the developer removed the trees on his lot. 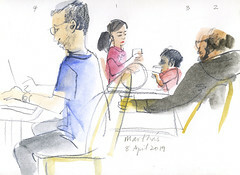 Also want to give kudos to Brandon Powell, Chairman of the NW Bernal Design Review Board, for keeping things civil, and organized. Thanks, Brian! I’m not sure that’s a universal sentiment, but I’ll take it! These look great– please build. Looks great and not out of scale with the neighbors. Too bad planning doesn’t allow 3 units instead of 2. I’d rather see 3 1600sqft houses than 2 2400 sqft ones but that’s just my opinion. 2 is a lot better than 0! Yes, in San Francisco, where making a declarative statement is akin to facism, removing trees from the private property that YOU OWN is considered volatile and unneighborly. 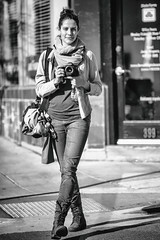 Thanks Bernalwood for the great coverage. 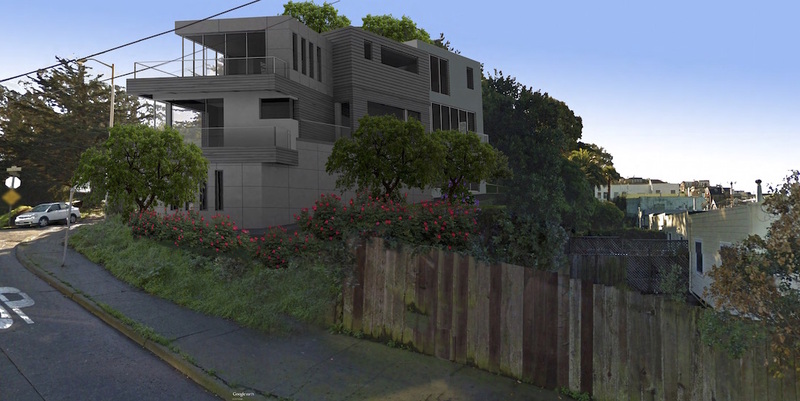 The houses look lovely and would be a welcome addition to my NW Bernal neighborhood . We shouldn’t forget that we are in the midst of a housing crisis, and the only way to alleviate it is to build more housing (as Bernalwood has noted before). I don’t fully understand the politics in this city and in particular why the people who are most affected by the crisis seem to be the ones most ardently blocking steps to solve it. I also don’t really understand this Design Review process and why if the builder already has approvals they need to go through this. But all that being said, I’m happy that this meeting went well and the project is moving forward.